Everybody loves puppies. Who wouldn't? They're so cute and cuddly and they usually grow up to be man's best fried. They say the reason a dog has so many friends is he wags his tail instead of his tongue. But that doesn't mean there aren't any ugly dogs. 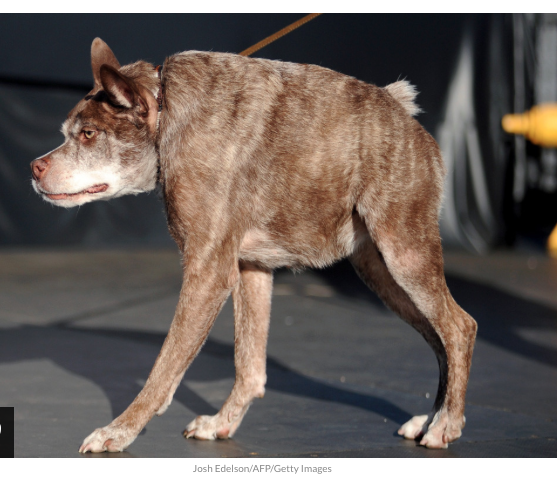 There are even competitions to find the ugliest dog, like the 2015 World's Ugliest Dog winner... Quasi Modo. Good call, that is one ugly dog but I'm sure he's still lovable, and that's what really counts. Well, it stands to reason that out of the 1,100+ Hamilton models there has to be one that would win the "least attractive" award. Of course, beauty is in the eye of the beholder so getting agreement of which model is the "top dog" could be a challenge. The Hamilton lineup in the mid 1950's has a lot of uniquely designed cases. It's almost as if the company was in it's "awkward teen years" with models with ears and teeth that were too big for their noses and foreheads. If I had to vote it would be for the 1954 Kenmore. To my eye, it looks like the Hamilton equivalent of a blowfish, but I think that's mostly because of the bracelet it was paired with. It was produced for three years so a lot of people must have liked it. Not much changed over the three years of production other than the price... it was increased by over 10%! Being made from 1954 through 1956, the Kenmore spans the transition from the 8/0 sized 747 movement to the 730 movement with shock jewels. So you'll find examples with either grade. If there's a 747 under the hood then it's an earlier 1954 version. Regardless of the movement, the Kenmore is a fine watch with a 10K gold filled case and a sterling silver dial with 18K numerals and markers. 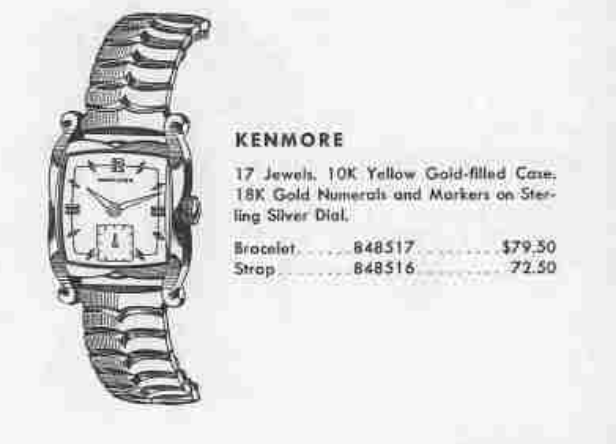 You could get the Kenmore on a strap or with a bracelet and the bracelet really brought the model's cooky look to life. My Kenmore project watch arrived in the typical "some attention required" condition. The Speidel bracelet doesn't look too bad with the watch but it's not original. Obviously the crystal will need to be replaced. Once the layer of "old man funk" is removed, I bet the case will clean up great. Time will tell - pun intended. The case back and the back of the lugs are sharp and undamaged. The sterling silver dial has a brushed butler finish that goes in different directions so it looks two-toned depending on how the light hits it. This dial is very dirty but there are no obvious distractions. The 730 movement is identical to the 747 movement with the exception of the incabloc shock jewels to protect the balance staff. It's been a while since this movement has had a bath, that's for sure. The inside of the case back makes identification of the model easy. There are a few watchmakers' marks inside to indicate the previous owner took good care of this watch. US-made movements had two different length cannon pinion and hour wheel options so that spherical dials or flat dials could be used. Sometimes dials are flat and sometimes they are domed. Domed dials require a longer cannon pinion and hour wheel to get the hands further from the main plate. The Kenmore has the longer setup. While everything is being cleaned, I will prep a new glass crystal for installation. The movement is back to running nicely and is installed in the timer to find out how well it's ticking. Everything looks great except for the beat error. The 4.9ms beat error means the balance swings further to one side than the other. That's corrected by repositioning the hairspring on the balance, effectively centering the balance impulse jewel with the pallet fork. It's a tricky exercise with this type of balance but 4.9ms is too high to let slide. My target is less than zero but I usually will accept anything under 3.0 if it's this style of balance. Every attempt at adjustment is also an opportunity to goof up the hairspring. So I don't like to do it if I don't have to. Success... this movement is now right on the money. Such an odd-looking watch deserves an unusual strap - in this case ostrich skin. As I predicted, the case turned out great. The new crystal allows you to see the dial much better and although the dial isn't "new", it doesn't look too bad either. Maybe this isn't Hamilton's least attractive model after all? I restored a Kenmore a few years ago though, and this one had it's original bracelet. Ugly watch or thing of beauty... You be the judge. Like you said, beauty may be in the eye of the beholder. The Kenmore reminds me of Baroque or Ricoco styles. I can appreciate the artistry, but definitely not my thang. You definitely cleaned this one up nicely, though. Yes, that's it. I kept thinking the style was like the furniture in Beauty and the Beast but I wasn't sure how to describe it. Rococo covers it well. I think I like this ugly duckling! BTW, love the blog DAN. I love the look, fins,fender skirts, neon juke boxes... got to love the artistry! I,m a little partial though. Wonderful restoration! 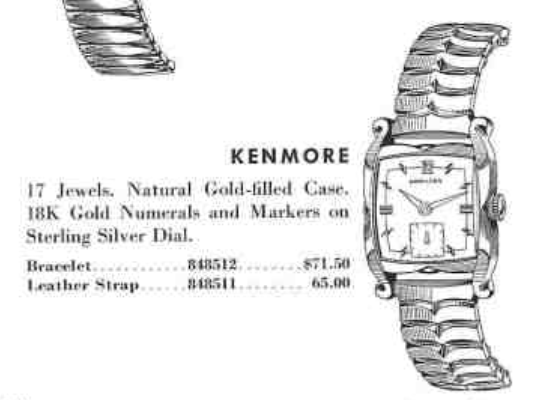 I think that the Kenmore was the best looking women's watch that Hamilton ever made for men P-). I own the one with the original bracelet pictured above and bought it specifically because my my collection focus is Hamilton milestone models. 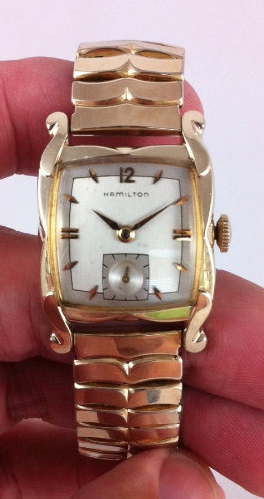 In my mind at least the milestone slot filled by the Kenmore is that it is the worst looking Hamilton wristwatch! Would I wear it? Absolutely not! Kind of reminds me of the French Provincial rage that was going on with home furnishings at that time. Lots of curves and curlicues. Not my favorite design style, but as you say beauty is in the eye of the beholder. Keep up the good work, Dan!